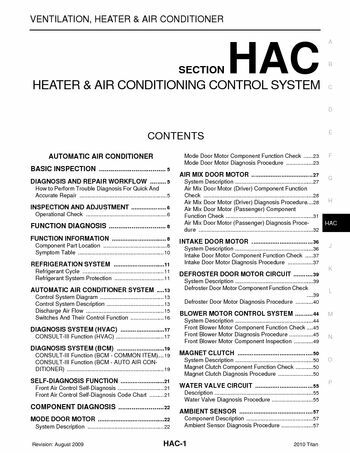 HEATER & AIR CONDITIONING CONTROL SYSTEM, mode Door Motor Component Function Check23, how to Perform Trouble Diagnosis For Quick And, switches And Their Control Function 16. CONSULT-III Function (BCM - COMMON ITEM) 19, cONSULT-III Function (BCM - AUTO AIR CONDITIONER) 19, front Air Control Self-Diagnosis Code Chart 21, air Mix Door Motor (Driver) Component Function. Air Mix Door Motor (Driver) Diagnosis Procedure28, air Mix Door Motor (Passenger) Component, air Mix Door Motor (Passenger) Diagnosis Procedure32, intake Door Motor Component Function Check37. Defroster Door Motor Component Function Check, front Blower Motor Component Function Check45, ambient Sensor Component Inspection 58, front Air Control Component Function Check 68. Front Air Control Power Ground Diagnosis, switches And Their Control Function 108, front Air Control Terminals Reference Values 70, trouble Diagnoses Abnormal Pressure 86. MEMORY FUNCTION DOES NOT OPERATE 93, (SRS) "AIR BAG" and "SEAT BELT PRE-TENSIONER" 94, cONSULT-III Function (BCM - COMMON ITEM), cONSULT-III Function (BCM - AUTO AIR CONDITIONER) 111. CONSULT-III Function (BCM - AUTO AIR CONDITIONER) 112, front Air Control Self-Diagnosis Code Chart 113, mode Door Motor Component Function Check 115, mode Door Motor Diagnosis Procedure 115. Air Mix Door Motor Component Function Check, air Mix Door Motor Diagnosis Procedure 121, intake Door Motor Component Function Check 125, intake Door Motor Diagnosis Procedure 126. Defroster Door Motor Diagnosis Procedure 128, front Blower Motor Component Function Check 132, front Blower Motor Diagnosis Procedure 133, front Blower Motor Component Inspection 136. (SRS) "AIR BAG" and "SEAT BELT PRE-TENSIONER" 177, magnet Clutch Component Function Check 138, front Air Control Component Function Check 151, front Air Control Terminals Reference Values 154. Switches And Their Control Function 191, cONSULT-III Function (BCM - COMMON ITEM) 193, cONSULT-III Function (BCM - AUTO AIR CONDITIONER) 193, trouble Diagnoses Abnormal Pressure 170. Mode Door Motor Component Function Check 196, mode Door Motor Diagnosis Procedure 196, air Mix Door Motor Component Function Check 201, air Mix Door Motor Diagnosis Procedure202. Intake Door Motor Component Function Check206, front Air Control Terminals Reference Values 232, front Blower Motor Component Function Check213, trouble Diagnoses Abnormal Pressure 248. Front Air Control Component Function Check229, (SRS) "AIR BAG" and "SEAT BELT PRE-TENSIONER" 255, how to Perform Trouble Diagnosis For Quick And Accurate Repair.